This afternoon, I got into my car and drove and drove, making the rounds, seeing my places. I went far from here, came back. I drove with the windows down, in silence, my hair whipping. I talked to myself, inside my head and maybe even aloud, for hours. I saw an Amish buggy ahead on Zion Road and slowed down so that I would not impinge upon it. I took an early turn from Zion, to pass over hills and around curves. As I turned, I saw two goats--one young, one old--standing side by side, watching the horse that was drawing the buggy. Today someone dear to me is in pain, and when I ask for a way to be helpful I am given silence, and all I can give back to the quiet from this distance is hope. Today the sun was so warm and the air so light that I skipped out on my workday and spent the last two hours of daylight walking and walking, bearing both cameras and photographing everything. I took 225 photographs. I practiced changing my good lens from one body to the other. I crouched next to a prairie and loved its tendrils. I thought of my brother, whose new boss asked him during his interview, "Are you a Nikon guy or a Canon guy?" I turn out to be a Canon girl. It's a cosmically bad joke--and one that I can make doubly bad: this literary critic shoots with Canon. 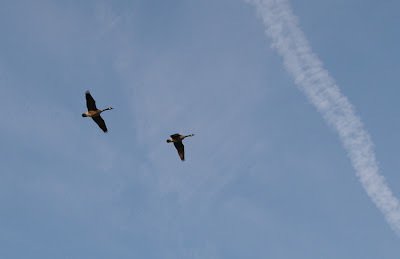 When these two geese flew over as the sun was going down, I tried to take their picture but had a crucial setting wrong on the camera. And I was worried for them; they seemed lost and frantic, hovering alone, the rest of their vee nowhere to be seen. They left me alone with a sky of hanging hawks. I counted: twenty hawks, circling together. A few minutes later, I could hear the geese coming around again, and this time I was ready. 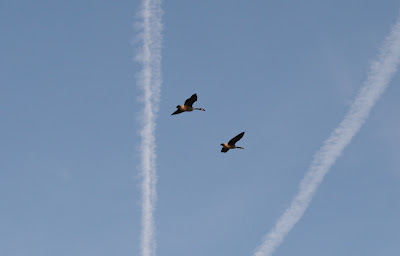 I have wanted a good picture of Canada geese for probably five years. It's no easy thing to get; somehow they get grossly sentimentalized when they're made into art, and I have never had the equipment or the know-how to get my own image. What I wanted was an image that would make me feel the way I feel when I hear them coming back as the winter slips away. What I wanted were the geese I got.